Brilliant character study navigating the decisions between good and bad. It really is best to go in not knowing much and just let Ivan and his fellow co-workers and family members fill you in on the missing details. Most of them are finding out who Ivan really is for the first time as well. Locke is struggling to come to grips with the decisions that he has to make, and then he has to tell people the decisions that he has made, and then he has to face the consequences. It’s a film about defining the difference between good and bad. Locke believes, and we are led to believe, that he’s a good person. But his actions and consequences of his actions can change that. He’s a bad person and he’s not ready to accept that. The film is also about change. As we learn more about Locke, we learn more about where he has come from, and he thinks he has changed. He thinks he has changed into a good person, but really he has changed into a bad person. Or perhaps that indicates that he hasn’t changed at all. Considering how much worse things get for Locke as he keeps driving, the audience will assume he’s driving towards disaster. But an interesting direction the film chooses to take is to remind us that not all change is bad. It could be good, or bad, or it’s just different. And you will determine whether the change is going to be good or bad. Or what the difference between good and bad is in the long run. 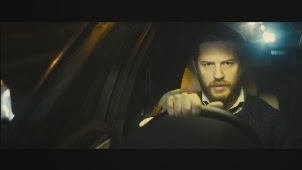 Locke features only Tom Hardy, his car, his determination and steadfastness in the moment, and his sanity. It also features his car’s phone system. It can remind people of Phone Booth (2002) or Buried (2010), but personally I find it closer to the former. The writing, in particular the phrases used in the dialogue at various points of the film, is tight. Visually, the film did everything it could to liven it up, switching from Ivan to the highway, over-laying the two views, zooming up and down the highway. It got a bit tiring. As a thriller, it can a bit slow or anti-climactic. But as a character study, it brilliantly lays out the choices in front of (and behind) Ivan Locke, and where those choices fall on the road between good and bad.